In The Journal of Clinical Nutrition, a study was published involving 430 children between the ages of six and 15. Half of the kids were given 1200 IU of vitamin D3 per day, the other half a placebo. At the end of the study, it was concluded that the vitamin D group was 43% less likely to come down with the flu. Keep in mind that many experts believe that we should all be taking a minimum of 5000 IU of vitamin D3 on a daily basis. Imagine the results if that were the dosage given in the study! Most controlled studies indicate that the flu shot is simply not effective. The best way to get your daily boost of vitamin D is through sunshine, as this method synthesizes not only vitamin D3 but also vitamin D3 sulfate, which is linked to optimal cholesterol levels. Especially during the holidays, we tend to get run-down in many ways: too much sugar, not enough sleep, massive stress, and too little exercise. My advice? 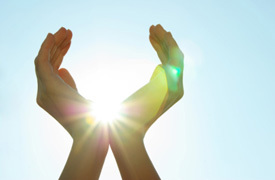 Get adjusted on a regular basis and get acquainted with the many gifts of vitamin D.